Nordic Berries™ Multivitamin Gummies 120 ct.
Home/Nordic Naturals/Nordic Berries™ Multivitamin Gummies 120 ct. Provides essential nutrients including zinc and vitamins A, B, C, D3, & E.
Nordic Berries contain essential vitamins, minerals, and antioxidants growing kids need. These easy-to-chew multivitamins capture the delicious sweet-and-sour citrus taste of Norwegian cloudberries. No wonder they’re the #1 Children’s Multivitamin in the U.S.! 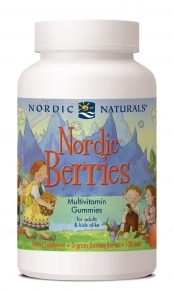 Nordic Berries are suitable for children 2 years and older, and make an ideal companion to any Nordic Naturals omega-3 product. Rich in vitamins, minerals, and antioxidants, this delicious cherry berry multivitamin supports good nutrition and wellness as part of a healthy diet. * Each serving provides your growing child with ten of the most essential nutrients, including zinc and vitamins A, C, D3, and E. With their great taste and nutritional value, the benefits of Nordic Berries extend from childhood through the teen years and into adulthood. For all ages to enjoy!